In the past, I’ve talked a lot about Pinterest and Twitter as tools for promoting your self-published books, but today I want to talk about a different platform: Tumblr. 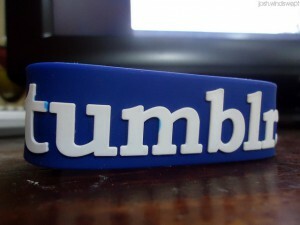 Tumblr is a micro-blogging website, but it allows you to cast a broader net than Pinterest and Twitter. It’s not as image-focused as Pinterest, nor are you as restricted in length as you are on Twitter. The content created on Tumblr is divided up into seven categories: text, photo, quote, link, chat, audio, and video. This wide range of post options gives Tumblr users freedom that you don’t have elsewhere on the web. Whether you’re uploading a photo collage that you created, a song you composed, or a blog article you wrote, you’ve got the tools to upload and share easily. However, Tumblr isn’t just about uploading, it’s about sharing. When you add a new post, your followers have the ability to “reblog” your stuff (guaranteeing you get credit) and share it with their followers. That’s, of course, the “social” element of the site. It’s also visually customizable, giving you the freedom to really build yourself a branded website with static pages and content (think FAQ pages, etc.) and a custom URL. All without paying for hosting or a web designer. So, with that info in hand, how do you know if Tumblr is the social network for you? Do you want to read and share OTHER blogs? – If you’re interested in connecting with other people who are blogging and sharing about similar topics, Tumblr is a great option. You can follow your favorite authors, brands, and more to really connect with your inspirations. It also gives you an excellent insight into what your prospective audience is interested in. Do you want to forego the hassles associated with a self-hosted website? – If you’re not interested in learning how to use WordPress or other self-hosted option, Tumblr is a versatile option to use as your “homebase” online. Are you frustrated by Facebook’s mysterious algorithms that seem to keep your best posts out of the feeds of your followers? – That won’t happen on Tumblr. If someone follows you, all of your posts will show up in their dashboard! Do you feel restricted by Twitter’s character count limits? – If you routinely feel that your thoughts can’t be contained in tweet-sized packages, Tumblr gives you freedom that you don’t have on Twitter. You can write long-form posts, using a standard web editor so it looks nice and pretty, to post and share with your audience. Do you have questions about how to use Tumblr to build your author presence online? Let me know in the comments!